FOR EVERY STEP OF THE WAY. Recommended by fertility experts. Won’t harm sperm. Pregnancy can place different demands on a woman’s body. This line of vitamin supplements offers essential nutrients you need throughout every step of your pregnancy journey. All in delicious gummies made with natural fruit flavors. Specially formulated for women who are pregnant or nursing. Each serving contains a blend of essential vitamins and nutrients, including calcium. 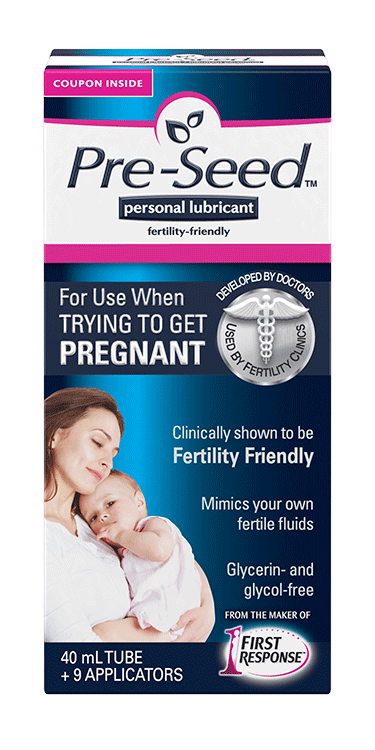 For couples trying to conceive, a fertility-friendly lubricant can make a world of difference. It not only enhances your pleasure and comfort, it’s specially formulated so it won’t limit or harm sperm like most leading lubes. Specially formulated to mimic your body’s naturally fertile fluids. Used in fertility clinics and recommended by fertility experts. When trying to get pregnant, an ovulation test helps you determine your body's biological "best timing" for conception. Used along with our ovulation calculator, an ovulation predictor kit from FIRST RESPONSE™ can be your best friend in the journey toward pregnancy. The ovulation test that predicts your most important fertile days with results in words. When you're trying to conceive, information is your best friend. Pregnancy tests from FIRST RESPONSETM give you accurate answers to one of life's biggest questions. No other brand can tell you sooner! You can know if you're pregnant in 45 seconds — on the day of your expected period. The ONLY Digital Test that provides results 6 days sooner than your missed period (5 days sooner than your expected period)4 —with easy-to-read “YES+ / NO-” results. 1Centers for Disease Control and Prevention. Folic Acid Recommendations. http://www.cdc.gov/ncbddd/folicacid/recommendations.html. Accessed February 9, 2015. 4>99% accurate at detecting typical hormone levels. Note that hormone levels vary.